Let me tell you something…a small space gets messier and more disorganized MUCH faster than a large space. The reason is simple…less space to be able to organize in! But somehow we still learned how to organize in small spaces and how to make the most of the space that we do have in our rv home. Here are some spaces that we have organized, what they looks like, and what they contain. We ditched our huge file cabinet and kept only papers that were actually needed (and important documents went in a safe). I found this small filing box at Walmart for around $15. This small box is much easier to manage and can be stored under the bed or in other small, unobtrusive places. 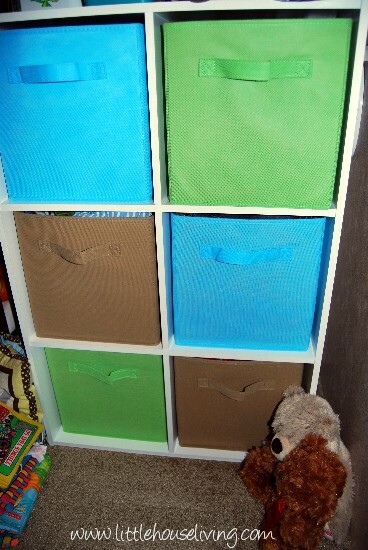 I created this little “dresser” with fabric storage boxes and a square shelf unit that we picked up at Target. It works excellent for little baby clothes since they are so small and can’t really been hung up anyways. Onesies, little pants, sleepers, ect fit perfectly in here. We also purchased one of these shelf unit’s for the bottom part of the inside of me and my hubsand’s closet but we didn’t use the fabric drawers for ours, instead we chose to just use it for folded clothing such as t-shirts, jeans, ect. I have these placed all over the camper! One unit we use for office supplies, another for craft and sewing items. This one pictured is in the baby’s space and holds everything from toys, to my cheap cloth diapers, to “school” supplies, to sock and hats! They are very useful and fit in our closets and in corners of the rv that aren’t good for many other things. I picked these plastic containers up for just $0.97 each at Walmart. 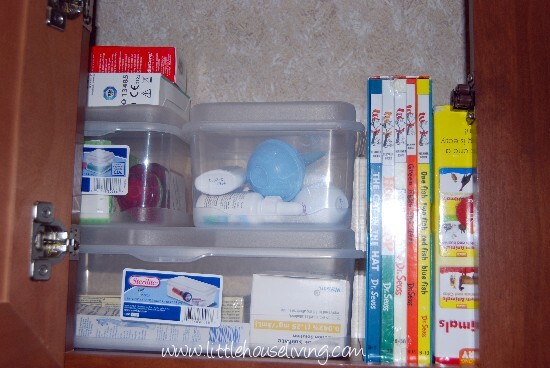 We use them to organize small baby items (thermometers, saline spray, ect) in the baby’s room and I also use them to organize some of the small items in the bathroom medicine cabinet. They are great for some small items that I was afraid might leak or spill! These have proved to be a very useful organization tool for such an inexpensive simple little thing. They were especially useful on a recent trip that we made…nothing spilled and everything stayed in it’s place! I’m sure there are more ways how to organize in small spaces but these are some of the things that we use and do to make our lives easier. In a small area we end up cleaning several times a day and I’ve had to create a fairly detailed “chore chart” to make sure we keep up with everything, but it’s nice to know that everything has a place here and if it doesn’t have a space we will likely find a different home for it and give it away. What are some other small space organization ideas? Do you use any of these things in your home? Those shoe holders that you put up on the wall? they are amazing for organizing/keeping things together. I have one full of embrodery thread and the ones at the bottom my daughter keeps her colors in, I even have one for nail polishes, etc. I live in a 5th wheel, Its 35 ft long and its usually fine for my hubby and i however when my grandkids come to visit we get a lil cramped! The gkids laundry was a huge problem, Where on earth to put it!? I decided to make laundry bags that would hang on a 5 tiered towel rack we already had in our bathroom. I cut the arms and necks out of t shirts and sewed the bottoms closed These bags will hold 2 loads of laundry each and the shoulder part makes a great handle! I used a different color to represent the color of the load of laundry the bag contains. yes, I’ve used the fabric bins like you have. I just rescued one from my daughter “garage sale leftovers” heading for donation. I organized the small toys that the littles play with at my house. 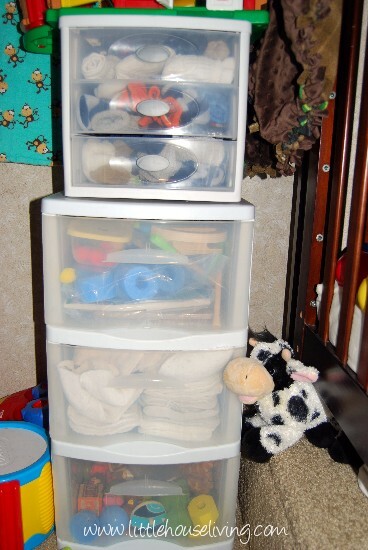 I have one bin for VEHICLES and one bin for CHARACTERS… the 3rd bin is for baby toys I still have a very small grand baby and one on the way…so those baby toys are separated. I use the clear drawers too , like you for first aid, meds, toiletries and such. We have a very small bathroom in our house. So these help. 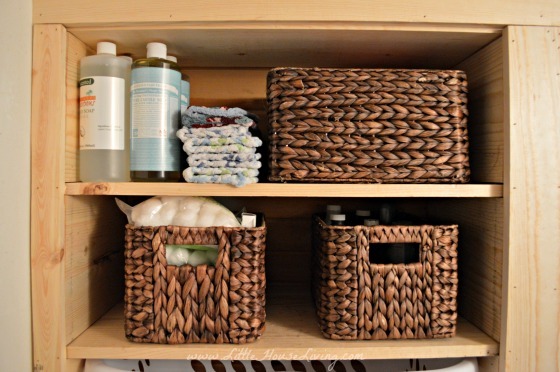 I did away with the clear shoe boxes due to space to keep them…but I have baskets in the bathroom. They are easier on the eyes! The one area that needs the most work for us…is paper! You’re ahead of me on that one. It’s a horrendous mountain! In desperate need of being tackled. I’d love a tour of your RV …have you posted that already, or is it coming soon. It looks like you have a baby bed on board. I’d love to see how you have added it into the furnishings. I live in 450 sq ft with my family of 9 and I couldn’t do it without those drawer sets! I use them for everything!! So enjoying this series! How in the world! Tammi Lewis you must be wonder woman ! 3 bedroom 2bath house, 2 kids under 4, hubby works on the road, and I’m about to go bonkers here! We salute you for sure! We moved from a 2400 ft house to 1400 feet, which I know is huge to some but small to us. Secured with screws, we hung clear shoe bags inside every closet door. My husband’s holds his socks, rolled into pairs and his belts, lint brush, etc. My shoes are the only ones small enough to fit in the shoe slots, so my shoes live in mine. In the spare bedroom I have the slots filled with office supplies, rolls of ribbon, bank deposit slips, stamps, envelopes, etc. The coat closet holds knit hats, gloves, sunglasses, scarves, sweat bands, etc. Each slot could be labeled with family members names. I simply and carefully cut along the middle seam of bags too wide for the doors to accommodate. These have been in use for 7 years and still look new. I’m so happy I found this!! We just started on out on our R.V living adventure a few weeks ago. 26 foot camper from a 1400 sq foot house. I decided I could no longer live as we were… A husband who would be gone for months on end traveling for work. Right now I’m still adjusting trying to find a “place” for everything. I’m looking for tips and stories from those who get it! Its me, hubby our daughter and a goldren retriever 🙂 I’m not sure how long we will be at this campground but I want to make it feel like home as much as possible maybe a little flower garden something? If we have to drag up and go will I have space for the planters or just leave them behind? I love the plastic container ideas and reading about others like us!! My Aunt Rose had her husband build her a raised bed on top of their travel trailer. Just a thought. She grew flowers mostly. About a year ago we moved from a 3700 square foot house to a 34 foot camper. We are having a hard time trying to figure out what we should keep and what is ok to get rid of. We have a storage building now but I would like to get rid of that extra cost. My goal is to have everything we owe paid off by the time my daughter graduates from college (3 more years) then retire from my career and become a beach bum. We have totally remodeled the camper (while also living in it) and organization is not the problem. How do you let go of 40 years of stuff???!?!??! I didn’t have 40 years of things but we did have a pretty good method for getting rid of things we no longer needed….it just takes time and that’s the key. Start with a small amount of things and slowly work your way through it, wait a few months and do it again, and again, and as many times as needed. It took us a year to go through everything we had 2 to 3 times. Each time we went through it we sold what we could and donated what we couldn’t. It helped to see a little extra cash come in! In the end we finally kept only what we could not replace and the things that we used every week. Good luck with everything! I just moved into a 29 ft fifth wheel. It took me about 6 months of selling and consolidating to fit and I am not done yet. Had to let go of a lot of family belongings. The way I’ve chosen to do so after the family made their choices, I rented a space at a second hand/antique shop. at least my beloved items will go to good homes and I have some change in my pocket. At this stage I rent a space at an RV park that allows long term. $340.00 per month. Includes water,garbage, sewer, electric and internet. It’s an exciting journey for me. I don’t know where I will end up but I’m comfy for now. By the way. I hire a mover to haul my home to it’s destinations. Saves me a ton in auto expenses. Omg omg any plans publish the chore chart? ?